If you decided to spend six months driving 45,000 km around the world what vehicle would you take? A Land Rover Defender 110 complete with a roof rack and all the gear? A Toyota Landcruiser built to take on the world's roughest roads per chance? Whatever your choice I seriously doubt that top of the list would be a Volvo estate car. However none of us are Christer Gerlach, a Swede with a patriotic passion about his motor cars. 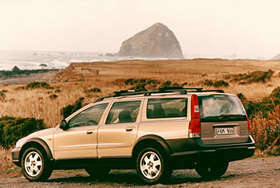 a Volvo V70XC. Alright so Volvo did produce the Laplander for the army, but they don't any more and they also produced the articulated snow cat thingy for the British Army but that is not practical really! The problem is that the XC is not really an off roader, it is more of a jacked up four wheel drive estate car, so would it be up to the job of a solo drive around the world? Mr. Gerlach certainly thought so and having already completed a solo drive from the northernmost tip of Alaska all the way down to the very bottom of South America he was obviously qualified. 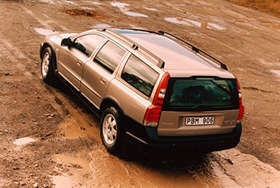 His reasoning was that Volvo make the world's safest cars and they are amongst the strongest. This is not due to a sense of public duty but more a case of protecting their market. It would seem that the Swedes have a hobby of crashing into elks whilst they drive. An elk is a big heavy beast and makes a nasty mess when you hit it and your car becomes very much second hand. Volvo are obviously keen that their customers do not die after an incident like this because they want to be sure that once they can walk again they will be straight down the nearest dealership for another new car! 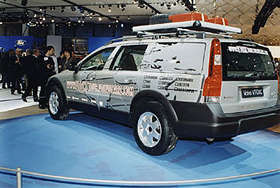 As well as being an adventure for Christer the trip was also to be a publicity stunt for Volvo and as such the XC was completely standard showroom spec the only modifications being a roof rack to carry an additional spare tyre, sand ladders and some fuel cans. Christer certainly believes in travelling light and when questioned as to what spare parts he was carrying he responded "People always ask what spare parts I bring. On this trip: two oil filters, some break pads, light bulbs... Well, that's about it. If the builder of the car suggests I need more, I think I pick another car." It would seem though that the most important piece of travelling kit as far as Christer is concerned is a rubber bath plug. In his experience most hotels in the lesser known parts of the world are sadly ill equipped with this vital little tool. Although quite happy to "rough it" our man does like a little civilisation and insists on carrying a table and chair complete with a tablecloth. He also insists that if you are to dine "al fresco" then you must start with a martini and as such he carries not only a thermos to keep it cool but also a proper glass to drink it out of. Aside from personal equipment and a hand winch in case of finding a really muddy section of road the Volvo was also equipped with a range of gear for communications expressly for updating the expeditions web site. An HP Omnibook laptop allowed Christer to write his daily diary whilst a Canon digital camera provide the facility to record those special moments. All this was backed up with a collection of mobile phones to rival a stockbroker's convention including an Ericsson satellite phone for those areas where GSM won't reach. Starting from Stenhamra in Sweden Christer's route took him south through Europe to southern Italy and Sicily. At this point Christer became worried that he was some sort of bad weather omen as the rain tipped down in a fashion never seen before in Italy. As he boarded the ferry for Tunisia and the African continent the sun once again began to shine. It was not to last long though as true to form as he arrived in the Sahara it was once again to pour with rain. Driving across the desert was to test the XC as loose sand hid treacherous rocks threatening to do serious damage to the underside of the car. The actual damage? A broken plastic under tray and a crack in a fitting for the windscreen washer. The route then took him across Egypt and north to Turkey before heading east again through Iran and Pakistan to India. Iran was to see the only mechanical fault on the Volvo. A nasty noise got Christer worried and he went off in search of a workshop. The mechanic had a listen and suggested it might be a wheel bearing. That would have been a problem, no one has imported Volvo spare parts into Iran for sometime. Fortunately it only turned out to be a loose pinch bolt on a steering rod that Christer assumes must have been damaged when he had hit rocks in the Sahara some two weeks previously. The route through Afghanistan and on to India follows some of the most dangerous roads in the world. If it is not perilous drop offs into steep valleys off the corners of narrow hairpin mountain roads then it is lunatic Indian truck drivers. Apparently at least 70,000 people a year are killed on India's roads and it is probably more as many deaths aren't reported. If you compare that to the British total of around 3,000 you will feel really quite safe next time you are on the motorway. Particularly as in this country at least the trucks don't overtake into the oncoming traffic. It was in Nepal that the car was to suffer its first puncture from a nail in the road. This in itself you would not consider to be to great a problem but the part which concerned Christer the most was when he found the tiny tyre repair shop the chap had absolutely no idea how to work a jack. It is not the sort of thing that leaves you brimming with confidence! Owing largely to the political situation in Burma it is not possible to drive through and so it was necessary to ship the XC from Calcutta to Singapore. This is a little more complicated than it sounds as a large amount of Indian bureaucracy has to be negotiated. It took a whole day to sort out the paper work required simply to allow the car onto the dock. Even when the car was safely in its container and on the boat for Singapore, India still had a last bite at Christer. Whilst on a stopover in Bangkok a ferocious virus struck hold incapacitating him for two days. Christer was convinced that not only was he a bad influence on the weather but he was now being punished by the Hindu god Shiva - The Destroyer, for saying bad words about India. From Japan it was time for the car to cross the mighty Pacific to the coast of California for the trek across the North American Continent. Being Swedish and driving a Volvo Christer had no choice but to divert his route to take in Gothenburg, Nebraska. 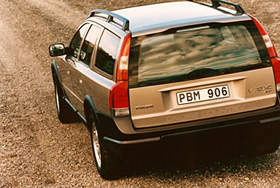 Unlike its namesake in Sweden there is no large car factory, there isn't even a Volvo dealership. There is a lot of corn though and a big pile of Swedish names in the phone book. n New York it was time once again to load the XC into a container and send it on its way to Liverpool. Having travelled almost around the world and visited some dangerous and unstable parts of the world it is with some irony that Christer finds himself robbed at a London hotel. With the itchy feet of the traveller once his car arrived he was keen to get on an took a tour of Scotland to fill the time before he had to make an appointment with the press at the motor show in Birmingham. Which is where World Off Road met him! he XC resplendent in graphics depicting a map of the world hardly looked like it had just driven around the world, which is a testament both to Volvo and Christer's driving skills. With only a few days driving left to get him home to Sweden, Christer was keen to push on and crossed the channel to travel via Paris back home. Christer has proved beyond doubt that the soft-roader is anything but. So don't scoff when you see an XC in the supermarket car park, it may just have seen more places than you or I. 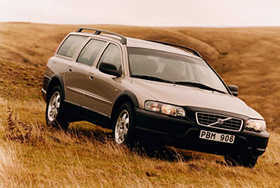 As for Christer he is currently enjoying time with his family but after 28 years of travelling I don't think it will be long before he has another Volvo and is off on another trip.